At some point, make an arugula salad topped with your favorite mustardy vinaigrette (olive oil, vinegar, mustard, salt and pepper); make about 3 tbl extra of the vinaigrette. Even better if you add chiffonade of radicchio to the salad. ½ a medium mild onion. a package cleaned sliced baby bella mushrooms. Uncover, top with your extra vinaigrette. Serve the salad as the side. Place the other vegetables and the jus over the farro, and the chicken there too or on the side, as you wish. 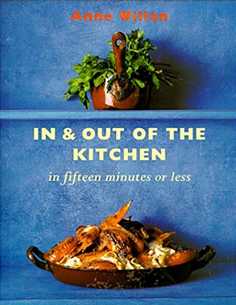 Very changed from the Salad of Fig-Stuffed Chicken with Blue Cheese in Anne Willan's 1995 In & Out of the Kitchen in Fifteen Minutes or Less, a wonderful source!